A PNW native, Diana came to physical therapy after laboring in Alaskan fisheries and working as an organic baker. No stranger to hard work and hard play, she understands and strives to return injured bodies back to their full potential. Diana grew up in Vancouver, WA and lived in Seattle for 15 years before she and her spouse relocated to Bend. Diana has provided physical therapy services and education to clinicians and individuals in the eastern European country of Moldova with Medical Teams International. 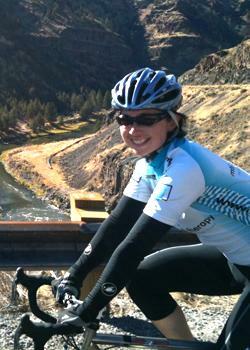 She has competed at the national collegiate level of cyclocross and road cycling with top 20 finishes. These days, she loves to road and mountain bike for fun and getting dressed up for a costumed cyclocross race. Her interests include hiking, biking, gardening, skate and telemark skiing.